Hello! 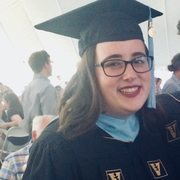 My name is Erin Elgass, and I am 23 years old with two degrees (bachelors and masters) in music education from Vanderbilt University. I just graduated with my Masters in Secondary Education, and I'm currently looking for babysitting opportunities while I am back home this summer looking for a full time teaching job this fall. I love working with kids, and I have experience as a babysitter, as a full-time student teacher, and as a sleep-away summer camp counselor. I have a car and clean driving record, an education license, and CPR/First Aid Certification. I'd be happy to answer any further questions you might have about my experience/qualifications!